Weaving together the lives of three inherently different women, Liane Moriarty’s The Husband’s Secret gives an intimate insight into each of their emotional struggles. First is Tess. She runs a successful business with her husband, Will, and her cousin, Felicity. The three have shared a close friendship for years – until one day, Felicity and Will confess that they have got even closer… And fallen in love. Horrified, Tess departs from Melbourne with their son, Liam, to stay with her mother in Sydney. There, she meets Celia – a woman with a seemingly perfect life. She’s got a gorgeous husband, two beautiful daughters, and when she’s not tending to her brood she’s keeping an immaculate house and doing a full-time job. Things have been slightly off between Celia and her husband John-Paul for a while – Celia has no idea why, until she makes startling discovery in their loft. A letter, faded with age, is marked by John-Paul – ‘to be opened only in the event of my death’. Eaten at with curiosity, much like Pandora, who Liane references at the start of the book, Celia opens the letter. In doing so, she opens a whole new, horrifying chapter – one that turns her life upside down of more than just her family. 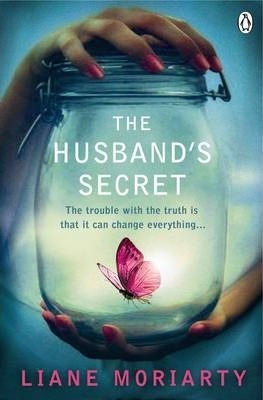 When I initially picked up The Husband’s Daughter, I thought it would be akin to a Jodi Picoult book – whose novels I’ve never been able to connect with – but I was pleasantly surprised to find a suspense-filled, gripping read that I genuinely struggled to put down (I took it into the bath to read – which was hot when I got in and stone cold when I got out). Moriarty weaves the threads of these three women’s stories together in a masterful, subtle way, resulting in genuinely unpredictable twists and turns. Evocative, bittersweet and ultimately uplifting, this novel is a surprising gem of a read.